Watch Walt Disney World’s New Year’s Eve Fireworks Live December 31! Continuing their 2015 tradition of live streaming park events, this New Year’s Eve, Magic Kingdom Park will welcome in the year 2016 with a special presentation of “Fantasy in the Sky” fireworks at 11:50 p.m. EST. The Disney Parks Blog team will celebrate by bringing this amazing show to you live, with a link right on the blog. To view the live stream, simply visit the Disney Parks Blog main page on Thursday night around 11:45 p.m. EST. The live stream will appear in a fresh blog post at the top of the site. Hope you enjoy the show and Happy New Year from the WDW Pensieve! We’re happy to share with you today that the next Star Wars offering set to debut at Walt Disney World, the “Symphony In The Stars: A Galactic Spectacular” fireworks show, will blast off at Disney’s Hollywood Studios on December 18 – and the Disney Parks Blog will be there to live stream the first show! “Symphony In The Stars: A Galactic Spectacular” is a dazzling Star Wars-themed fireworks show that’s set to memorable music featured throughout the saga. The spectacular will be featured nightly at the park. Interested? Tune in on Friday, December 18 at 11 p.m. EST. The Disney Parks Blog will launch a fresh blog post just before showtime. We hope you can make it! Walt Disney World to Live Stream “Mickey’s Very Merry Christmas Party” December 6! The Disney Parks Blog series of live streams will continue this Sunday, December 6, with a live stream of “Mickey’s Once Upon A Christmastime Parade” and “Holiday Wishes: Celebrate the Spirit of the Season” fireworks live from Mickey’s Very Merry Christmas Party. The live stream of “Mickey’s Once Upon A Christmastime Parade” will begin at 8:15 p.m. EST. It’s a joyous holiday-themed parade that features favorite Disney characters, dancing gingerbread men, marching toy soldiers, elves – and an appearance by Santa Claus himself! 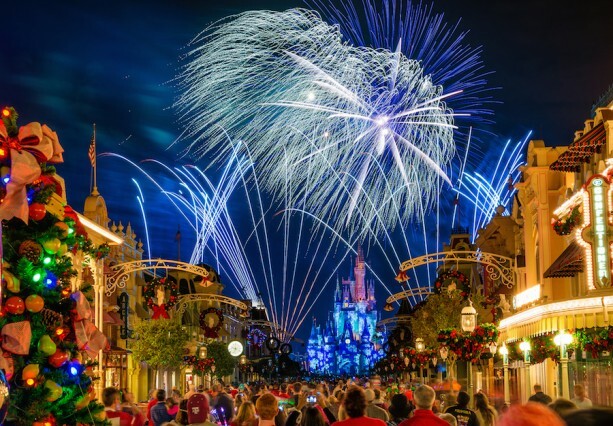 Then tune back in at 9:30 p.m. EST for “Holiday Wishes: Celebrate the Spirit of the Season” fireworks, which takes the celebration of the season to the skies high above Cinderella Castle. To view the live streams, the Disney Parks Blog will launch a fresh blog post on December 6 just before showtime. We hope you can make it! Disney Parks Blog’s series of Unforgettable Holiday live streams will continue this week with a live look at The Osborne Family Spectacle of Dancing Lights on Wednesday, November 18, at 10:30 p.m. EST.